Do you know what Kanro got right? Coffee candy, that’s what…right down to the typical coffee breath after you’ve long finished your tasty cuppa Joe. I have no idea how they managed that but can I really detract pea points for getting that true to the original source? No, I cannot although I might mention that there are times and places for improvement and coffee breath time may have been one of those times. Still, coffee breath. I’m kinda impressed. I’m also a little confused about this. I’m not sure what has a scale of -3 to +3 and why these are at -2. I suppose it says in Japanese what’s going on but I’ve been trying to figure out what it could be talking about and I got nuttin. I can’t even quip amusingly about it because…what? -2? 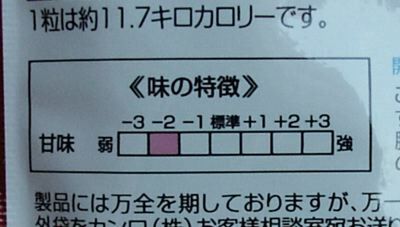 -2 what? But I didn’t want you Junkies to go uninformed so there you go. Kanro Cappuccino and Espresso Coffee candies are -2. I thought I might also mention that despite the No Sugar Added tag, corn syrup is pretty high on the ingredients list. It’s technically not sugar I guess but these are not the coffee candy of a diabetic’s dreams either. These are the best coffee candies we’ve had so far at the JSFR which includes Sumiyaki Coffee Candy (2.5 wasabi peas), Latte Latte from the Lotte Inryo Mix 5 (3.5 peas for the Latte Latte 4 peas overall) and Kasugai Sumiyaki Coffee Candy (2.5 peas). 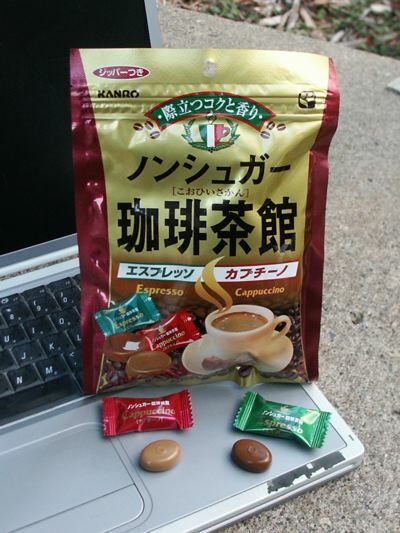 These may very well be the best coffee candies ever because they are really quite good. I had a cappuccino candy on the day I photographed these (the espresso candy jumped off my computer and into my petunias so I opted not to taste that particular one) and I was right pleased. It’s got a spot on coffee flavor tempered with a nice milky creaminess. Plus, it’s a nice smooth candy that won’t rip your tongue to shreds (think Wurthers smooth). The cappuccino candy was also sweet but I like a packet of sugar in my cappuccino so I wasn’t bothered at all. You black coffee drinkers might find the cappuccino a bit sugary but if you come at it thinking of hard candy rather than coffee, the sweet won’t be that overpowering. My favorite Guinea Pig started with an espresso candy which…woah. The cappuccino seems a little weak afterwards. The espresso candy is like a small, hard sugary shot of the real thing. It is, of course, less milky (and probably why it seems 110% more COFFEE flavored) and much stronger than the cappuccino candy, as it ought to be. In general, the Pigs gave these candies many thumbs up…save the Pig who accidentally coughed while crunching on her candy. She managed to shoot little bits of espresso candy into her sinuses to which she had to say “Oh dear god it burns! I’ma gonna DIE!! !” So if you are inclined to snort these candies instead of consuming them in the usual hard candy fashion, you’ve been warned.